We have provided information for you to advocate for Healthy Start, which aims to reduce Florida’s infant mortality rate, improve birth outcomes and promote healthy child development. If you have any question regarding maternal-child health data and initiatives in Orange County, please feel free to ​contact us. Healthy Start Advocacy Cards are available to assist you in advocating for moms and babies in Orange County. This card folds into four panels to reach a size of 4.25 inches in length and 2.75 inches in width - a bit larger than a business card - and includes information for both legislative and community advocacy. This tool is generally used by our board members. However, if you would like Healthy Start Advocacy Cards for your use, please contact us for assistance. 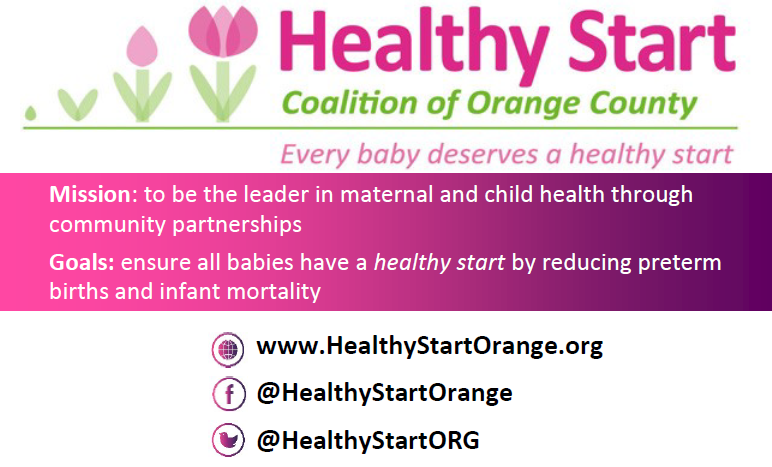 The Healthy Start Coalition of Orange County is one of 32 Healthy Start Coalitions within the state. ​Healthy Start Coalitions across the state are charged with developing and implementing quality systems of care by funding maternal and child health programs in the community.